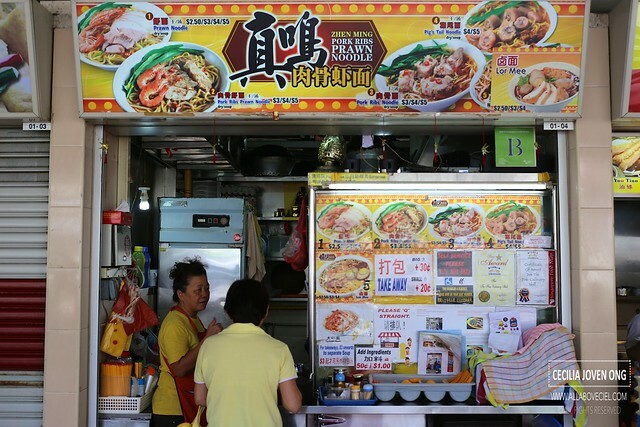 This stall has been around for quite a while, they started at Tampines then moved to Serangoon and to the current location. I was there at about 12.30 pm on a weekday and there was a queue of a few people right in front of the stall. 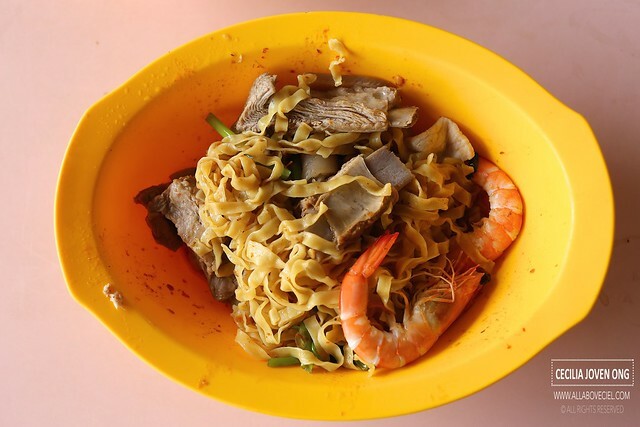 There are quite a few selection available, starting from Prawn Noodle ($2.50/$3/$4), Pork Ribs Prawn Noodle ($3/$3/$5), Pork Ribs Noodle ($3/$4/$5), Pig's Tail Noodle ($4/$5) and Lor Mee ($2.50/$3/$4). 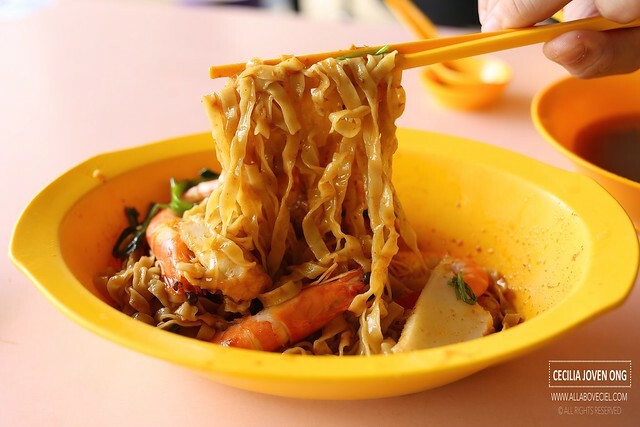 I went for Prawn Noodle at $4 and Pork Ribs Prawn Noodle at $5. Just right after i placed my orders, only 2 more bowls were left as i saw Auntie got ready those 'SOLD OUT' tags and was about to put it out. As i ordered both at the largest portion, it was served in an oval shaped bowl rather than the usual round one. Auntie suggested i should have a saucer of dark sauce with red cut chilli and light soya sauce for the other one since i ordered 2 portions. She asked whether i would want to have it with fried shallots and fried pork lards before she scooped them onto the soup spoon and placed it on the saucers of red cut chilli. Auntie arranged everything neatly on the tray for me to bring to the table and she asked me to come back for the other bowl of soup later. She even called out to the cleaner that happened to be standing in front of me to be watchful and not to knock against me. I was a bit amazed when she said thank you in english when i came back for that bowl of soup. 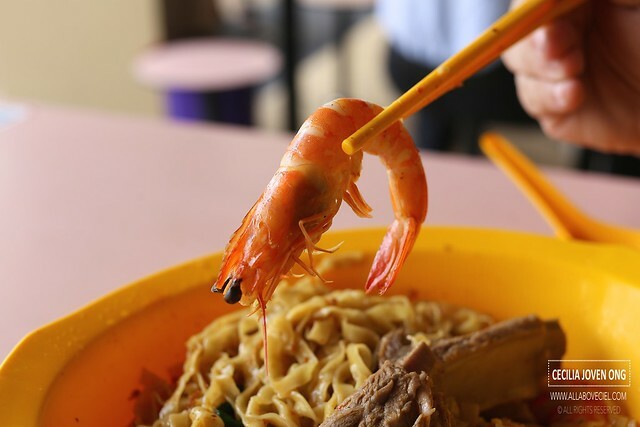 For the $4 Prawn Noodle, it is served with 4 pieces of prawns together with a few stalks of green, few slices of lean meat and fish cake. Though i requested to have extra amount of chilli added but the level of spiciness was just comforting. 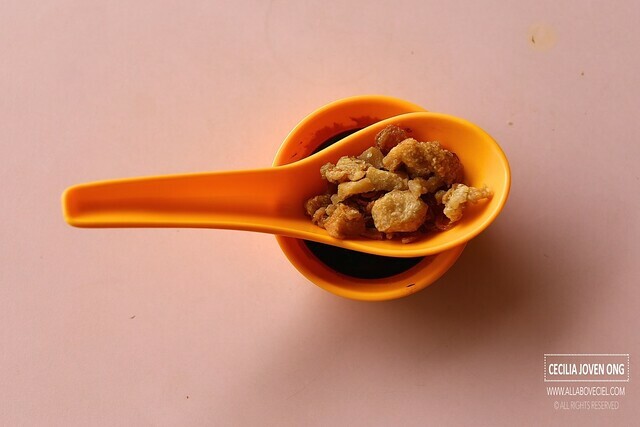 The spoonful of dried shallots and fried pork lards added just a bit of flavor as the fried pork lards were not as crispy and not as fragrant. The rest of the ingredients tasted very fresh particularly those few pieces of prawns. The mee pok was abit too soft to my liking and not as springy as expected to be. The soup was still good even though the prawn flavor was not as intense. If you look at it carefully, they made an effort to remove the shell from the centre part of the prawn so you do not need to dirty your hands to remove it yourself. Such thoughtfulness is definitely commendable. The $5 portion of Pork Ribs Prawn Noodle came with quite a few pieces of pork ribs and 2 pieces of prawns, a few slices of pig's skin and greens. Auntie was saying that pig's skins were given for free as it is not usually included in it. The softness of those pork ribs was amazingly good, it was so soft that it came off the bone effortlessly. Even for those pig's skin, i did not have an intention to eat it initially as i am not a fan but i started to like it after eaten the first piece. 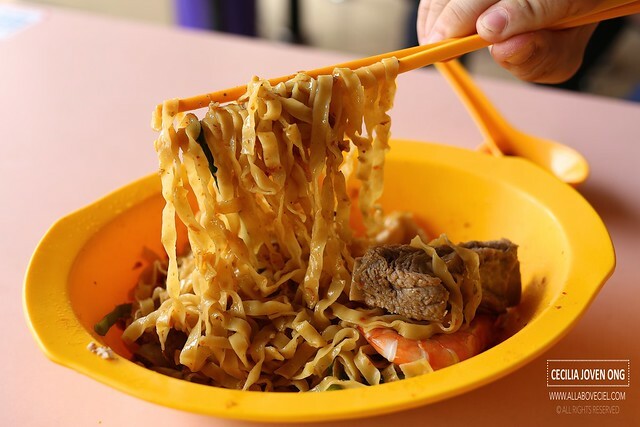 The texture of mee pok was the same, a little too soft and lacking of springiness. I actually this to be in the soup but Auntie heard it wrongly i suppose. 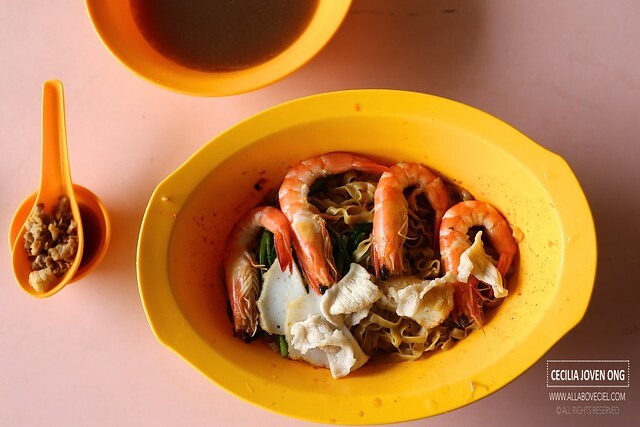 And what exactly distinguish them from other Prawn Noodles has to be their broth. 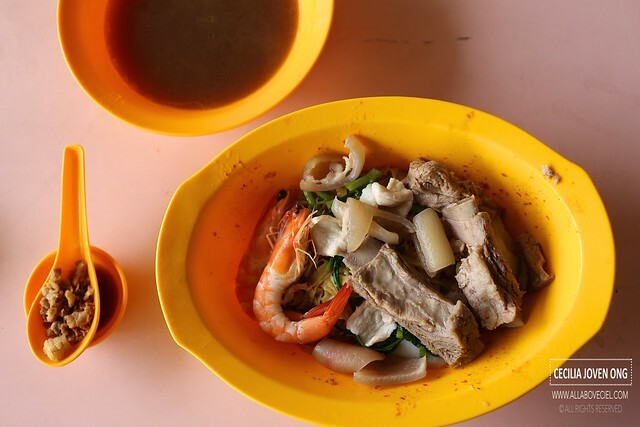 They added in ingredients like pork ribs, pig skins, red dates, prawn shells and also a chicken. Instead using the rock sugar, they replaced with black sugarcane from Malaysia to give the broth a delightful natural sweetness. 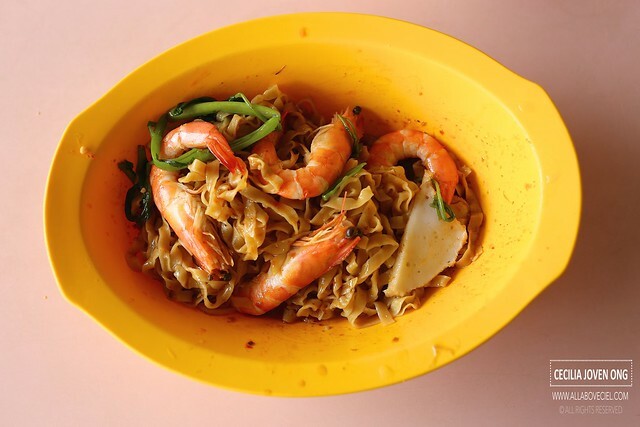 Block 162 Ang Mo Kio Avenue 4 #01-04 Mayflower Food Centre SINGAPORE 560162.